On Saturday, March 23rd, 2019, a group of women (and men) gathered to protest against the rampant sexual harassment of women at Ogbete Market, located in Enugu, Nigeria. 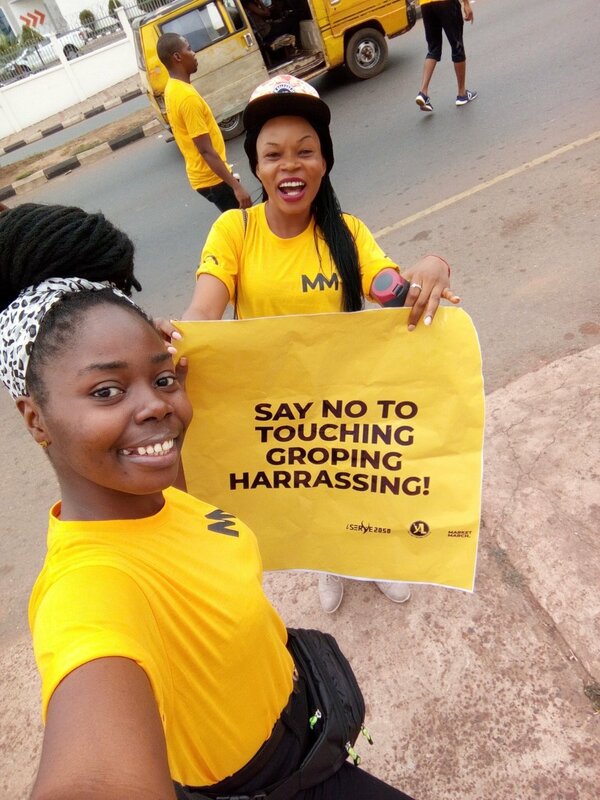 Donning their signature yellow shirts while equipped with signs, the protestors marched from Polo Park Mall to Ogbete to “sensitize, educate and warn” perpetrators and enablers of harassment. Despite a market-wide sensitization session prior to the demonstration, protestors were still met with hostility and general pushback from vendors. Reportedly, marchers dealt with responses like, “we must touch!” and “women come to the market naked.” Some older women turned to victim blaming, arguing that young girls were being harassed because of what they wore to the market. These unfortunate remarks highlight one of the many ways internalized misogyny manifests among women. The negative responses, however, failed to deter marchers from making their voices and message heard loud and clear: the sexual harassment of women must come to an end. Although some traders showed hostility, others actually expressed support for the cause. According to reports from Market March, various female traders cheered marchers on and offered encouragement during their demonstration. Market March Ogbete was the second chapter of the rapidly growing Market March movement. Inspired by a twitter thread highlighting the “acceptable casual harassment” of women at markets, Damilola Marcus founded Market March in October 2018 to put an end to the normalized culture of sexual harassment and bullying that’s rampant at markets. Currently, it’s nearly impossible for women to navigate markets without encountering some form of harassment from vendors. This might come in the form of cat-calling, groping or a general invasion of personal space, driven by misogyny and a wide sense of entitlement towards women’s bodies. Within a few months of the organization’s launch, the first march was scheduled for December 15th, 2018 at Yaba Market in Lagos. On that day, women bravely took to the streets to defend their rights to a market experience free of harassment. Despite the meticulous planning that went behind the event, nothing could have prepared the women for the violence they faced at Yaba Market. Male traders were incensed by the demonstration and resorted to dehumanizing tactics. They threw water at us, called us prostitutes, sluts...ashawo.. They said it was our fault that we got harassed. They claimed it was because of our clothing & asked us to stay home if we didn't want to be harassed. Despite all this, the march was a huge success. Thousands of people expressed their support for the march through social media, and a peition pushing for the enforcement of anti-sexual harassment and bullying laws currently has over 37,000 signatures. 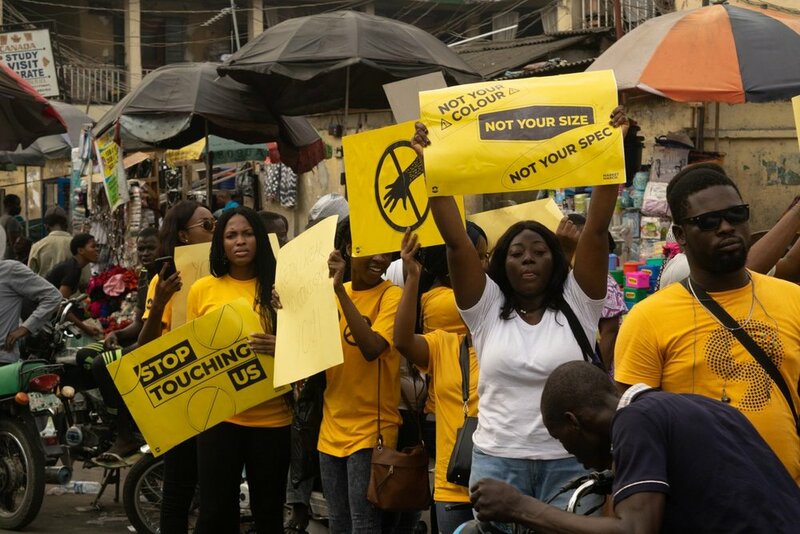 On Twitter, women shared their experiences of returning to Yaba market after the march, claiming that they encountered fewer incidents of harassment. Been in yaba market for about an hour now and none of these guys have touched me yet. Shook. Really can't believe it. Guyssssss, I just passed through Yaba Market and nobody touched me. I am so happy, I hope this will last. Kudos to @OmogeDami and other women that led the march. Follow MarketMarch on Twitter to learn more about the movement and to stay updated on upcoming marches.